Today the pace of life is speeding up with increasing reliance on fast food which may be inadequate to satisfy the daily nutritional requirements of the body. In order to maintain a healthy body, a supplement becomes necessary to be incorporated in the daily dietary regime,which takes care of all the nutritional requirements of the body and helps to maintain a balanced and healthy life. In addition to this, minerals like Iron and calcium play a vital role in in overall growth of body and conditions like pregnancy, menstruation etc. Shaktiwelis an unique dietary supplement which is scientifically designed to address the wellness of bones, blood, muscles, nerves, heart, immune system, skin, eyes, hair and nails. The formulation emphasizes the logical addition of other vitamins and trace minerals which enhance the bio-availability as well as the utilization of Iron and Calcium. 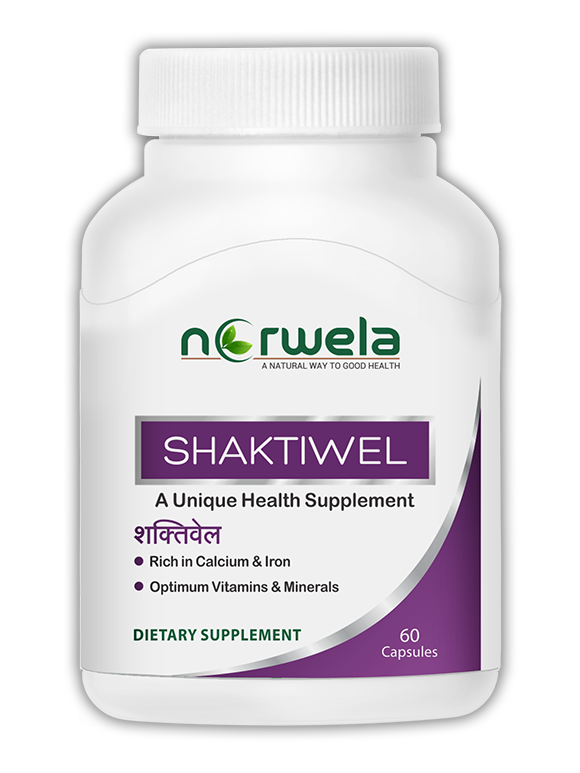 Shaktiwel is fortified with essential minerals such as vitamin D, phosphorous and magnesium that help in the easy absorption of Calcium into the body, whereas manganese and vitamin K help in utilization of calcium for bones and cartilage synthesis. Iron along with folic acid, vitamin B12 and Vitamin B6 support the normal red blood cells production and energy utilization. Presence of vitamin C, vitamin E and copper promotes the absorption and utilization of Iron.It can work as a boon for pregnant and lactating women where the requirements of not only the mother but also the child are taken care of. Shaktiwel contains goodness of vitamin A and zinc which are vital for healthy skin and eyes. It is enrichedwith vitamins E, C and seleniumwhich help to boost immune system. Presence of both iron and calcium in a single formulation provides an added advantage. Thus, Shaktiwel not only nurtures your body with the essential nutrition but also ensures that these nutrients are adequately absorbed and properly utilized by the body.